Republican Congressman Steve King — now facing two G-O-P primary opponents if he seeks reelection — has issued a statement saying he’s an advocate of “Western Civilization’s values” but not white supremacy. 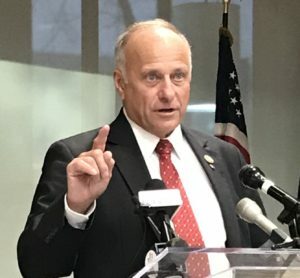 In late October, King drew criticism from some Republicans after he tweeted his endorsement of a white nationalist running for office in Canada. Ohio Congressman Tim Ryan, a Democrat, has just called on the U.S. House of Representatives to censure King. Yesterday, Republican state senator Randy Feensra of Hull announced he would run for King’s seat in 2020. Today, the mayor of Irwin, Iowa, told The Des Moines Register he plans to against King run, too.